NOGALES, Ariz. (AP) — Donald Trump's ambitious plan to build a giant wall on the border hits close to home for people like Berenice Andrews. The front door of her family's home is just feet away from a fence separating the U.S. and Mexico. The home is so close to Mexico that the sounds of schoolchildren at play south of the border can be heard. So can buses along a main thoroughfare on the Mexico side. As the presidential contest shifts to Arizona and its Tuesday primary, Trump's wall stirs up a range of emotions among border-area residents like Andrews. For some, nothing short of a wall will do. For her, the fence that currently divides the U.S. and Mexico is a good enough barrier. "For him to even propose something like that is complete insanity," Andrews said. Everywhere Jim Chilton goes on his sprawling cattle ranch along the Mexican border in Arizona, he has a gun at the ready. Guns at his front door. Guns in his pickup truck. Guns on his horse's saddle. For Chilton, illegal immigration and drug smuggling isn't just something he hears about on the news. He lives with it every day as smugglers routinely cross the border on his property. He supports just about anything to stop it, including Trump's plan to build a wall from one end of the border to the other. "We need a wall. We need forward operation bases. We need Border Patrol to be down there all the time," Chilton said. "We just need to secure that international boundary at the border, period." While Chilton hasn't decided who he'll vote for in the presidential election, he certainly supports the idea of building a wall. "I'm tired of having thousands of people coming through my ranch. I worry about running into a guy with an AK-47 and a bunch of druggers behind him," Chilton said. 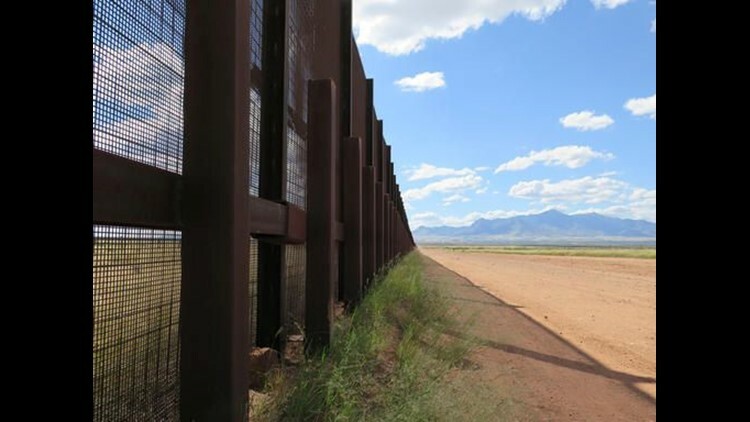 "The United States needs to secure its international boundary." Artist Kate Drew-Wilkinson lives in Bisbee, AZ, where she owns a gallery a few miles north of the border. Drew-Wilkinson opposes Trump and his wall proposal, saying he's a bully who is dangerous to the United States. "I don't think he has a real understanding of the geography or the sheer difficulty of building a wall of that kind," she said. "And it's ugly. The whole thing is really ugly." Drew-Wilkinson, an England native who moved to the U.S. in the late 1960s, wouldn't reveal who she would be voting for but said it definitely wouldn't be Trump. He is sick of politics as usual and finds Trump's lack of political correctness refreshing. He isn't bothered by Trump's lack of specifics about how he'd build a wall. "That really rang a bell with me and a lot of the ranchers, that finally we had somebody in the political arena that wasn't worried about being politically correct and talked about the problem that is actually happening," he said. Ladd said he isn't sure the wall will ever actually be built but said he believes Trump will enforce immigration laws. As of late, though, Orozco said he can't get behind the party and its ideology. To him, America's biggest challenge is the deficit and the economy, not illegal immigration. "It's like they're trying to distract us from the bigger problems," he said. "(Illegal immigration) is a problem but it's not the biggest problem." And he said a wall wouldn't resolve immigration problems in any way. "People will find a way to improve their lives," Orozco said. "Regardless of how big the wall is, they're gonna look for a way because they're gonna want to make a better life for their family. Not all who cross are criminals."